Established in 1959, Brighton Dam’s Azalea Garden is home to over 22,000 azalea bushes over 5 acres in a hardwood forest. Kousa dogwood trees were added in the 1990’s and the garden is also home to Montgomery County’s champion fringe tree. The idea for the garden was from WSSC Commissioner Raymond Bellamy. WSSC Watershed Manager Paul Hancock led the work as the garden was planted in the late 1950’s and 1960’s. An updated gazebo was installed by WSSC watershed staff in 2012. Ben Morrison was the former Chief of the Plant Introduction Section and Director of the National Arboretum, United States Department of Agriculture. 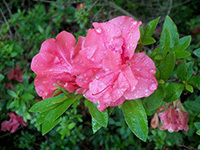 Glenn Dale, MD is the location of USDA’s Plant Introduction Section and Morrison named the variety of azalea in honor of the community. Azaleas are not the only thing that thrive in the garden. Maryland's state champion fringe tree (Chionanthus virginicus) calls the Azalea Garden its home. Recently, WSSC has planted several new beds, including one devoted to deciduous azaleas and another bed filled with Gable Hybrid “Karen” azaleas. The majority of the azaleas in the garden bloom around Mother’s Day. The Azalea Garden is scheduled to reopen in Spring 2020. Glacier - Very large, leafy green plant, white bloom - midseason. Coral Bells - Shell pink, shaded darker, early. Hino Crimson - Single, brilliant red, non-fading, early. Hinodegiri - Single, brilliant scarlet, heavy bloomer, early. Hinomayo - Single, soft pink, foliage small, plant tall, early. Pink Pearl - Salmon rose, with light centers, early. Salmon Beauty - Salmon pink, light green foliage, early. Salmon Queen - Large plant, salmon colored blossoms - very late. Snow - Snow white, very compact growth, early. Herbert - Semi double, large frilled and ruffled, dark crimson, purple, midseason. Royalty - Double, bright purple, midseason. We have a few deciduous varieties planted near the main entrance to the gardens. These plants are upright and tall, with very large flowers and a very striking range of colors from yellow orange to orange red. They are midseason bloomers. Indica Rosea - Large flowers, flushed pinkish white, midseason. Indica Alba - single, pure white, broad grower, late. Indica magnifica - Single, large flowers, spotted and flushed with pink, late. Macrantha - Single, salmon red, very late. Where can I find more information about azaleas? 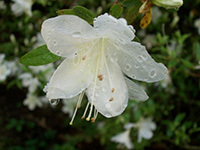 Check out the Azalea Society of America web page at www.azaleas.org. 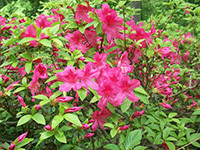 Another good source for information about azaleas can be found at www.theazaleaworks.com. 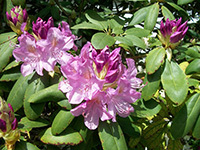 A broader source of information that includes rhododendrons as well as azaleas can be found at the American Rhododendron Society web site at www.rhododendron.org or at the Rhododendron Species Foundation web site at www.rhodygarden.org/index.html. If you are looking for a particular azalea variety, check the Plant Sources Page for tips on locating a source.